Sept. 8, 2011 My adventure to Cochabamba, Bolivia started with my first flight from DC. My uncle and mom said their goodbyes and dropped me off at the airport. Once inside the airport, I checked in, got rid of my checked luggage, and went through security nearly pain free. After all that, it was only 2:45. I had plenty of time since my flight to Miami wasn’t until 6. I found a spot to sit down near my gate, and I pulled out my iPhone and headphones and decided to take advantage of some of my final hours of the unlimited use of a smart phone. After sitting for a while, I looked around the airport and saw someone I recognized. I found Mark, who was also going to Bolivia with me. I grabbed my bags and ran to catch up with him. I was very happy to be able to spend the rest of my time in the airport with someone I know. The weather outside the airport was getting darker and grimmer every minute. I knew the weather in Miami was fine, but I was worried that our flight would get delayed because of the weather in DC. Fortunately, our plane arrived perfectly on time. We boarded with no problems. Despite boarding with ease, we still had to deal with a weather delay. Our plane along with two others had to wait at the airport until the weather from DC to Miami cleared. After almost an hour and half, our plane took off. We were originally going to have around a two-hour layover in Miami, which would have given me plenty of time to make some final goodbye calls and text messages. Because of the delay in DC, however, we had to go straight from one plane to the one taking us from Miami to La Paz, Bolivia. We made it to the plane with time to spare. I settled into my seat and had some time for the goodbye calls and texts. Like in DC, weather became a problem again. We had to wait as the plane received more fuel so that we could take a different route to avoid some bad weather over Colombia. After only a 15-minute delay, I was in the air and on my way to Bolivia. This flight had a much different feel from the flight to Miami. Spanish became the primary language on the plane, and the people were different. To my right I had a view out the window, and to my left sat a gentleman who was originally from Bolivia but moved to the United States. asked why I was going to Bolivia and where I was going. I told him Amizade’s Cochabamba program and how I’ll have classes and community service. He told me good things about Cochabamba; it has great food and large portions as well. Of course, he also had a few warnings. One of the biggest ones was not to drink the water. He also warned me about the altitude. Although La Paz is higher than Cochabamba, Cochabamba is still very high. He told me not to eat too much, for a very full stomach and high altitudes do not mix well. He seemed to be completely confident that I would enjoy my time in Cochabamba, especially since he mentioned that he would be visiting the city for a week while he’s in Bolivia. Before the plane had even taken off, the flight attendants began handing out customs and immigration papers for entry into Bolivia. This made me think that it was going to be a long and difficult to get through the airport in La Paz. I pulled out my passport and other paperwork and began filling out the forms and the visa application I had received at check-in back in DC. I worked on those during take-off. About an hour later, the flight attendants came around with dinner. Once they came back around to collect the trays, I turned on my iPod and fell asleep. I woke up around 4 AM. About thirty minutes later, the pilot announced we would be landing in La Paz in about twenty minutes. I finished filling out my papers and began anticipating landing in South America. All four of us from Amizade were on the same plane to La Paz, and we ended up meeting each other in line for immigration and customs. All of us were unsure about what to expect while actually entering into Bolivia. Even though my Spanish is pretty good, I was really hoping the immigration and customs officers spoke English; they never spoke a word of English to me. I had to use my Spanish skills right from the beginning. I successfully obtained my visa, and the only thing I had to do for customs was turn in a paper. I think what was most important to them was making sure I had a passport and paid my $135. The four of us went through the airport and checked in for our final flight to Cochabamba. We hadn’t gone through airport security yet, so we stepped outside for some fresh air. The air felt cold and crisp; it was about 37 degrees Fahrenheit outside. Off in the distance we could see some of Bolivia’s beautiful Andes Mountains. We all took pictures, but my camera could not capture their beauty. After about ten minutes outside, we went back in, found a café, and waited to board our flight to Cochabamba. While I was waiting in line to board, I met a Bolivian, who frequently travels between Cochabamba and DC. The flight to Cochabamba was no more than 30 minutes. For most of that time, I stared out the plane’s window as we flew over more mountains. We got off the plane, got our luggage, and met our site director, Jean Carla, and professor, Vivian. They walked us to the van, and we began making our way into the city to take us all to each of our homestays. Cochabamba was much warmer than La Paz. It was already at least 50 degrees. Cochabamba has some of the best weather in Bolivia and possibly in the world with hot or warm dry days and cool evenings and mornings. The city is also beautiful. It is in a valley and is surrounded by mountains. The airport is on the south side of the city, and our homestays are all toward the north. The driving in Spain was crazy, but the driving in Cochabamba seems even more chaotic. Not all of the roads have lines painted on them, and there are a lot of roundabouts. We all made it safely to our new homes though. I live with Jean Carla’s mother, Lucy, and another lady, Pola, who lives and works in the house. I have my own bedroom with a big bed and a room attached to my room with a big desk and a view of the garden and some of the city. Right outside my bedroom door is a little bathroom as well. After I unpacked, I lied down and took a nap until lunchtime. Later that evening, Jean Carla took us to a supermarket called IC Norte. The parking lot was full, but we finally found a spot. As we got near the entrance of the store, there were girls handing out free samples of beer. I did not expect to see that. I cannot imagine that happening at a grocery store in the US. The store was full of people. Walking around in there was almost as chaotic as driving. Overall, however, the store was not much different from a store in the US. It was pretty much like a Kroger or Food Lion. It even had a small area where you could buy prepared fried chicken meals with fries, plantains, and a drink. I got a few things and spent almost 50 Bolivianos, which may sound like much but it was less than $10. 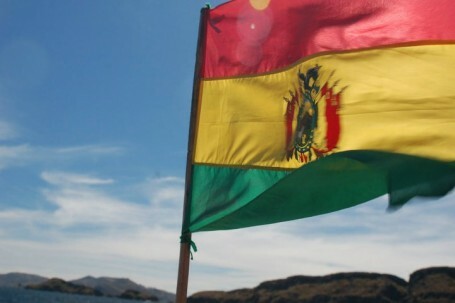 This was pretty much the end of my first day in Bolivia. Mikhael – Great blog! I could actually visualize some of your experiences. I’ve been doing the google thing for Cochabamba so I could learn about where you’ll be staying the next few months. I liked your version better… it sounds like a beautiful place! I’ll definitely keep up on your blog time! Love you!